Over the past few months I’ve read a lot about Yuji ramen and its omakase offering with only 6 seats at the Whole Foods Bowery counter. I did my best to get tickets; I signed up for their friends and family listserve, clicked numerous times on Kitchin for tickets as servers were crashing and managed to score the entire bar for me and my friends. SUCCESS! 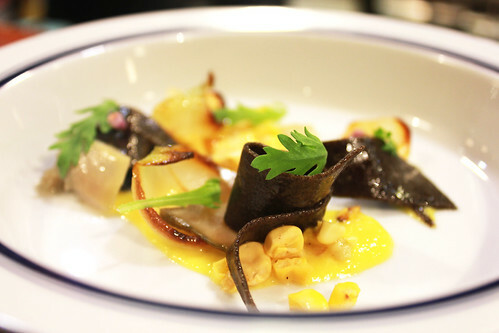 Yuji Haraguhi stresses that his seafood, which is incorporated in each course, is all sourced locally with the help of Whole Foods, and tries to reuse ingredient leftovers as much as possible. 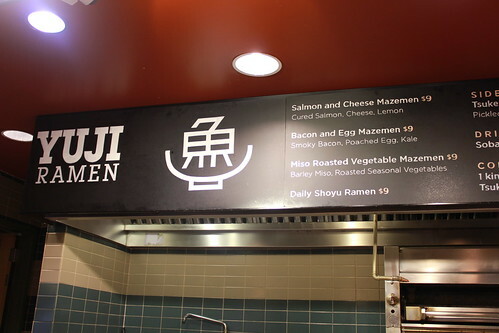 His three mazemens, a ramen with no broth, are normally served at Whole Foods so you can get them whenever you like (oh yes, I’ve been back a few times already). 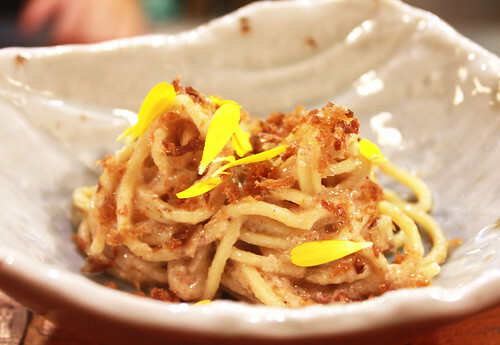 His omakase is comprised of seven courses for $71, each course incorporate a form of noodle and toppings. For me, what made the dining experience was hearing Yuji explain how he put dishes together, his inspirations that stemmed from investigation and novel takes on food. Now, onto the delicious food! 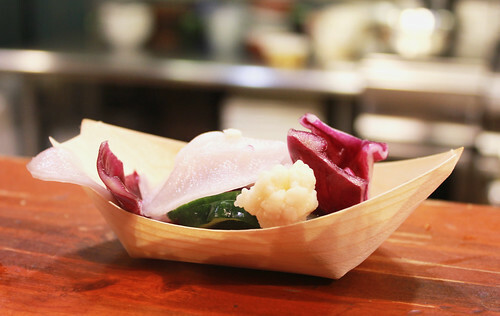 We started off with pickled vegetables – califlower, radish, cucumbers, etc. Good way to start the omakase. The next dish had several components: conch that was confit in ramen fat, pureed roasted corn, caramelized onions, toasted soba malligaliati ramen, shungiku and basil flower. It was a delicate balance of flavors, slightly sweet and savory at the same time. 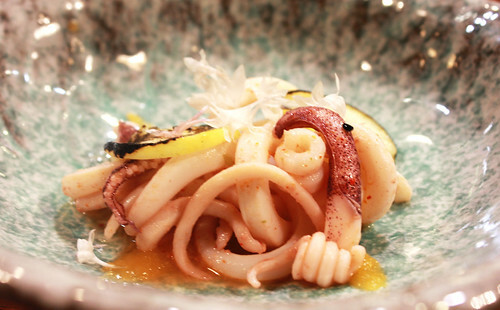 Squid was the “noodle” in this dish, served with summer melon, yuzu kosho puree, torched pickled lemon cucmber, togarashi, yuzu and fish sauce. Again all the flavors were balanced and the squid was well cooked. 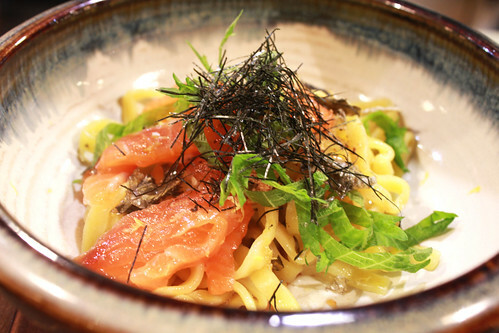 Their salmon and cheese mazemen – house cured salmon, camembert cream cheese, lemon zest, salmon skin, nori and shiso. It was one of my most famous dishes of the night. The salmon and cheese work so well together, just enough creaminess, “al dente” bite and umami flavor. 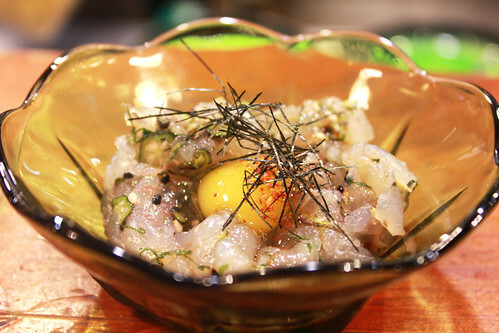 This dish was comprised of two parts – fluke tartar with okra, shiso, scallion, miso, ginger, quail egg yolk and a ramen cracker. It was definitely a nice Asian seafood take on the tartar concept. 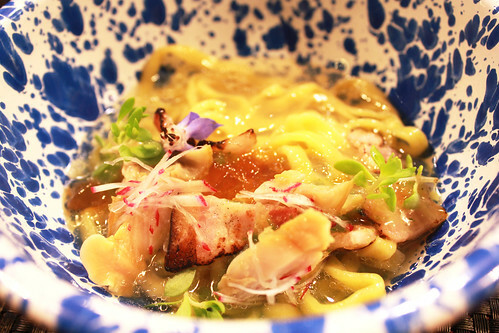 This chilled mazemen highlighted the soft-shell crab from Maryland, with crab chips and calendula flower. It was a delectable bite with a good contrasting texture of the chips with the soft noodles. Pictured on top was the clam broth in gelee form. Within the gelee was ponzu, grated kirby cucumber, stone crop, radish, smoked bacon, borage flower that was later served with hot noodles and melted the gelee into broth (pictured below). Another famous dish involves using a fresh press. 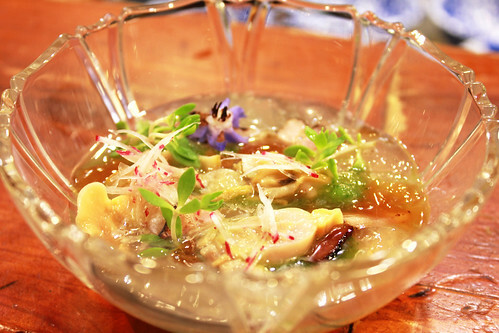 Yuji explained around how ramen broth is essentially a conversion of water, just like coffee. 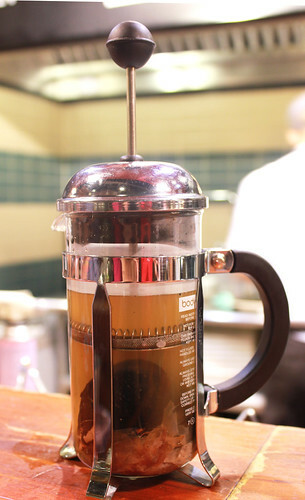 By using a coffee press, you can release flavors into water while straining small particles. He first torched leftover mussel shells and then placed them in broth within a french press so that you can press down and release all the mussel and seafood flavor. 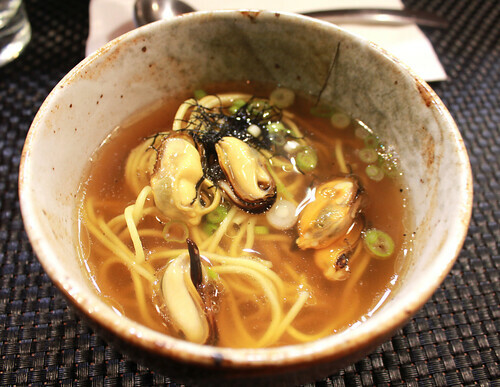 The ramen noodle with mussel broth combined with grey tilefish, scale powder, scallion, nori and mussel meat. Delicious and had umami flavor yet was very light. Soba Tofu Panna Cotta was a perfect way of ending the meal. 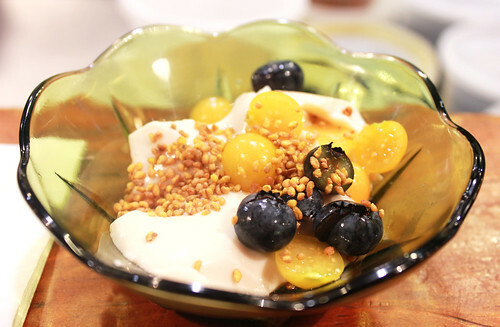 The panna cotta was served with wild blueberries, husk cherries and toasted soba. I loved how the texture of the silky panna cotta was juxtaposed with the crunch of the toasted soba. The fruit gave it a gentle touch of sweet and refreshing flavors. I would highly recommend going to Yuji Ramen, whether it be for their omakase or their regular menu. 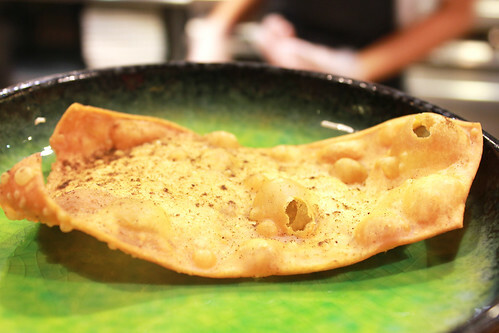 Their menu and omakase is affordable and absolutely delicious. I plan on going again in the future since they have a very seasonal menu so if anyone ever wants to go again, let me know!